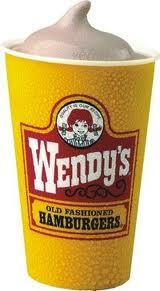 Along the Boardwalk, Wendy’s has a monopoly as far as traditional fast food restaurants go. So this was another favorite spot to stop at the end of a beach day if we decided against a 7-11 Slurpee (see my healthy recipe here). I can do without several of those ingredients, so here is my version of Wendy’s Frosty- a healthy and sustainable smoothie better tasting than the original fast food treat! This is my all-time favorite smoothie that I make! Place all ingredients into a blender and blend until frozen banana is broken up and completely mixed. Makes 1 serving.